← That Rainy Day Feeling Again…. Another Fashion Trend I Will Be Ignoring.. They come and go, fashion trends. Some I adore and some I ignore. I adored the baby doll style top trend, the velour sweat suit trend, even the skinny jean trend. I especially loved the tousled “do nothing” with your hair trend. Anything that saves me time and hides the evidence of birthing four children well is a fashion trend for me. I hated, therefore ignored, the return of bell bottoms trend, the short short with high heels trend, the bra as a top trend, the jumpsuit trend and many others. One that has recently emerged is especially bothersome to me though. THE SOCKS WITH OPEN TOE SHOE TREND!?!?!? At first I thought it was just a fashion error made by some teens who were too lazy to take their socks off or way overdue on the pedicure, then I saw it more often and on women much older. Nothing about this look is appealing but I applaud the trend setter (wherever she may be in her socks and sandals) for attempting to stretch the seasonal life of the sandal this year but, no thanks, not for me. It kind of reminds me of the guy who used to live across the street from my childhood home who cut his grass in black dress socks and sandals. It just seems unnatural, like a winter coat with a bathing suit or sweatpants with a fur wrap. You know it is bad when even LV and Burberry can’t make it look good. So, no, you will not see me around town in socks with open toe shoes. Yes, I will wear socks and open toe shoes, but definitely not simultaneously. And to those who dare to jump on the trend bandwagon and wear the offensive combo, I hereby reserve the right to “I told you so!” when you question your decision years from now. This entry was posted in Everything else, Fashion, Uncategorized and tagged Burberry, fashion, Louis Vuitton, LV, sandals, Shoes, socks, socks and sandals, socks with sandals, trend, trends. Bookmark the permalink. 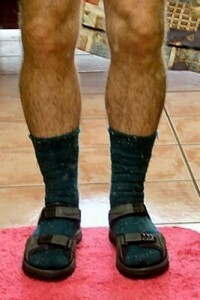 4 Responses to Another Fashion Trend I Will Be Ignoring..
I’m interested in this new trend as a way to hide my cankles. Does that count? Lol…you so do not have cankles! But that would be a reason to excuse the use of this trend I guess. I think the look would not be flattering on anyone. Even these models can’t make it look good.